Advanced Font Viewer is a software download with the user-friendly interface that allows simultaneous viewing of all fonts installed on a system. An example text for each font is displayed alongside. The program allows managing and printing your fonts as well. 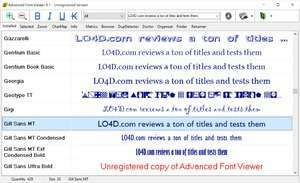 For security reasons, you should also check out the Advanced Font Viewer download at LO4D.com which includes virus and malware tests. Additional screenshots of this application download may be available, too.